Definition - What does Extended Marichi's Pose mean? Extended Marichi's pose is a revolved standing posture that is practiced with a chair and wall as props, and sometimes yoga blocks. Depending on the arm position, this pose is appropriate for yogis at a beginner or intermediate level. 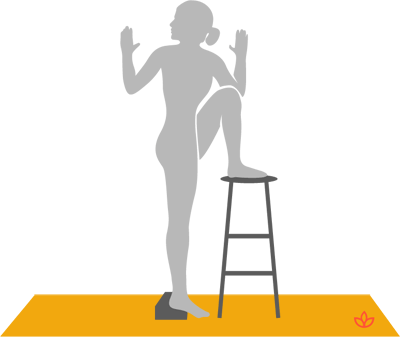 Standing with the side body to the wall, the yogi places the wall-side foot on the chair and then turns the upper body until facing the wall. One common hand position has the opposite elbow or hand placed outside the knee of the bent leg while the other hand rests on the wall. The pose is known in Sanskrit as utthita Marichyasana. It is also one of several poses called standing spinal twist. Yogis who have low or high blood pressure or suffer from migraines, bronchitis, chronic fatigue, or knee, hip, back or shoulder injuries should not practice extended Marichi's pose. Women should skip this pose during menstruation. Finally, a yoga block under the heel of the straight leg will allow better rotation for those with limited flexibility.